In reality modern nations and free societies are but an illusion. There are those among us who consider themselves the Elite of humanity. These would be emperors feel it is their right and destiny to control and rule (not govern) this country and indeed the world. What you will read here is but an introduction for the uninitiated … This saga is centuries in the making, and only now approaches maturity. There is no longer much doubt that this Oligarchical Elite literally owns our military, our leaders, our country, our money and their main instrument of modern propaganda, the mainstream media. A recent Princeton study clearly states America is no longer governed by Democracy but is ruled by an Oligarchy. The preoccupation, misdirection and constant propaganda provided by the MSM makes their actions and agenda almost impossible to ferret out … almost. This level of control is made possible by the divisiveness they instill in us through a constant barrage of fear, hatred and prejudice from birth. This Elite controls the ebb and flow of capital across the globe and can control or strongly manipulate Nations through central banking and the International Monetary Fund. This control is almost absolute, especially since they are willing to do whatever it takes (via a total lack of conscience) to maintain that extremely valuable (in terms of power and money) control. Bribery, Extortion, Murder and Perpetual Warfare are their tools and mechanisms of manipulation. We Are not talking about your local bank here, we are talking about the banking powers that tell them when where and how high to jump … and when they can come down, and that they better not dare repeat what really goes on behind the veil of public perception. Humanity is in imminent danger and our programmed failure to recognize this and push back against it only emboldens their actions! Genocide or the culling of the herd is much easier today with tools like GMOs, vaccinations, engineered disease, geo-engineering, pesticides, fluoridated water, global warfare and many other mechanisms at their disposal, and under their complete control. Indeed this control works so well that via the manipulation of governments, they not only have the power to control humanity but in many cases force us, through unjust laws and taxation, to fund the very mechanisms of population control or culling they deem necessary to maintain this power they possess. Almost every war in the last few centuries has been fought for the profit and strategic goals of this caste. Untold millions have died or suffered extreme poverty to satisfy their lust for profit, control and power. But if we are only seen as cattle to be manipulated for their goals … Do we have any attack of conscience when slaughtering cattle? When you try to picture this Elite, the Ruling Oligarchy or those who consider themselves to occupy a caste so far above the rest of humanity, that they would refer to the rest of us as cattle, to be thought of and treated as such, there is one family, the true Oligarchy of all tyrants, that stands above all on the list, being responsible for the rise and fall of kings, queens, emperors and nations. In 1791 the Rothschild dynasty also gets control of this nation’s money, through Alexander Hamilton (their agent in George Washington’s cabinet) when they set up the first central bank in the USA called the First Bank of the United States. This is established with a 20 year charter. Although not a permanent entity, it facilitates the infestation of the US government from that point on. 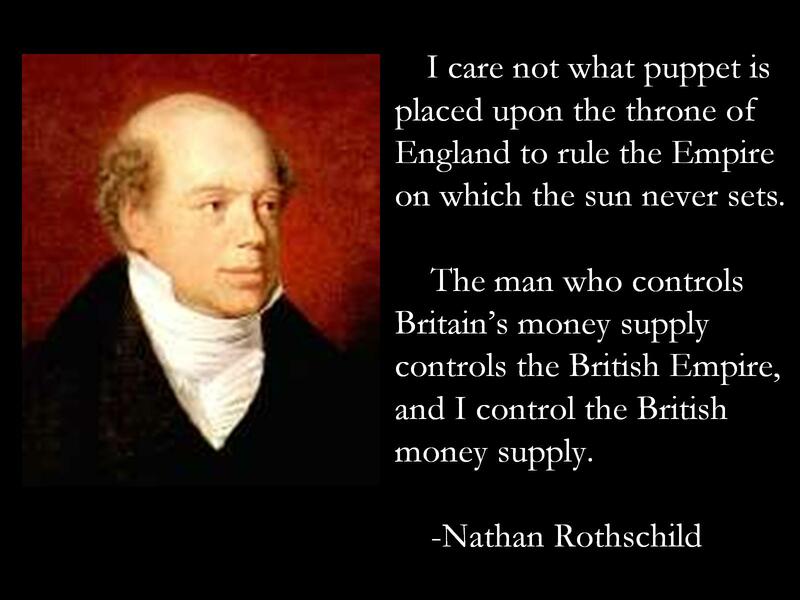 With the Rothschild family net worth estimated far in excess of $100 TRILLION (about twice the total world debt), and controlling interest (Via the intermingled and interbred eight families) in just about every major financial institution on this planet. This cabal is estimated to have a cumulative net worth far exceeding $300 TRILLION, their influence and power go far beyond what most can ever imagine. Nations, presidents, emperors, monarchs and even despots bend before their collective will … or suffer the catastrophic consequences! What you will find below is an outstanding explanation of this dynasty, its global tyranny, mechanisms of control and its ultimate goals. TLB highly recommends you visit its website of origin for more pertinent information. Since America’s inception there has been a lingering notion that European Illuminati bankers seek to bring America to its knees and return it to the fold of the Crown of England, which centuries ago became the key political vassal for the Eight Families who own majority stock in every private central bank in the world- Rothschild, Rockefeller, Kuhn Loeb, Lehman, Goldman Sachs, Warburg, Lazard and Israel Moses Seif . Many US Presidents warned of the intrigues of the cabal, including George Washington, Thomas Jefferson, John Adams, John Quincy Adams; and later Andrew Jackson, Abraham Lincoln and John F. Kennedy. The latter two were assassinated for trying to nationalize the Federal Reserve via the issuance of Treasury Department-backed (publicly-issued) currency. The Eight Families own 52% of the New York Federal Reserve Bank, far and away the most powerful Fed Bank. Their ownership is disguised under names like JP Morgan Chase, Citigroup, Goldman Sachs and Morgan Stanley. Do I exaggerate when I claim that there are Eight Families? Well, yes, actually these oligarchs have interbred to the point that they are now, for all practical purposes, one big family, with the Rothschilds being the most powerful. Their net worth alone is estimated at well over $100 trillion. These people, whose latest justification for lording over us is that they are descended from Jesus Christ himself, are, for obvious reasons, counter-revolutionary. In their collective if obtuse minds, there are no good revolutions. Democracy is antithema. Government is something that only gets in the way. It must be discredited and bought. The American Revolution really pissed these inbreds off. In Canada, Australia and New Zealand, the Crown of England still holds sway via the Governor General. Most European countries retained their monarchies. In America, we had a revolution, democracy and government. A medieval rollback of the American Revolution begins with the concept that “government is the root of all evil”. This strain of thinking is promoted by the Saudi/Israeli-owned Fox News. These nations are not “Islamic” and “Jewish”. They are fronts for the Crown of England and the Rothschilds. The well-paid corporate lackey leadership of the Republican Party pushes this anti-government agenda, while the idiocracy misnomer known as the Tea Party takes this monarchist argument to its fascist extreme. Key to this revolutionary rollback is that seminal event- 911- which was used by Windsor family country cousin George Bush Jr. to dismantle our Bill of Rights, bankrupt our nation and destroy our image throughout the world via two oil-grab, narco-stimulant, contractor-friendly wars. In the weeks before 911 the financial weekly Barons reported that Deutsche Bank had purchased huge put options (betting that a stock will go down in price) on American & United Airlines, and WTC reinsurance giants Munich RE, Swiss RE & Axa. Deutsche Bank, historically owned by the Nazi-funding Warburg family, bought Bankers Trust in 1999 to become the world’s largest bank with $882 billion in assets. Bankers Trust, as its name indicates, had been the Eight Families’ US wealth repository and is the largest shareholder of the Four Horsemen- Exxon Mobil, Chevron Texaco, BP Amoco and Royal Dutch/Shell- who later reaped the Iraq/Afghanistan oil bonanza. In 2001 Sen. Carl Levin’s (D-MI) Banking Committee fingered Banker’s Trust as a major player in drug money laundering. On August 28th, just two weeks before 911, Deutsche Bank executive Kevin Ingram pled guilty to laundering heroin proceeds and arranging US weapons sales to parties in Pakistan and Afghanistan. A June 15, 2001 New York Post article said Osama bin Laden was the likely buyer. Kevin Ingram is a close friend of Clinton Treasury Secretary and Goldman Sachs insider Robert Rubin, now a board member at Citigroup. Ingram had worked at both Goldman Sachs and Lehman Brothers. Banker’s Trust purchased the fast-growing Alex Brown investment bank in 1997 before the two merged into Deutsche Bank. Alex Brown took its name from founder A. B. “Buzzy” Krongard who served as chairman until the 1997 Bankers Trust buyout. Krongard is now the #3 man at CIA. On September 15th, four days after 911, the New York Times reported that Deutsche Bank Global Private Banking Chairman Mayo Shattuck III had suddenly resigned. Mohammed Atta and two of other alleged hijackers had accounts at the Deutsche Bank Hamburg headquarters. There were reports that bin Laden’s family had taken a large stake in Deutsche Bank with help from Carlyle Group financial advisor George Bush Sr. The bin Laden’s had $2 million invested in Carlyle Group. They held big stakes in Microsoft and Boeing, and had extensive business dealings with Citigroup, GE, Merrill Lynch, Goldman Sachs and Fremont Group (recently spun-off by Bechtel). Within twenty days of 911, Deutsche Bank had hired away (effectively silencing) SEC lead investigator Richard Walker, whose main task would have been to delve into the mysterious shorting of airline and insurance stocks prior to 911. The final phase of counter-revolution can be accomplished through the withdrawal of Eight Families’ funding of America’s $11 trillion debt, which has mostly accrued due to the US military’s role as mercenary praetorian guard of the Illuminati global empire, coupled with a devastating US military defeat in Afghanistan. On August 15, 1871 Sovereign Grand Commander of the Ancient & Accepted Scottish Rite of Freemasonry General Albert Pike, who later founded the Ku Klux Klan and prosecuted the Indian Wars, wrote a letter to Italian P-1 33rd Degree Grand Commander and Mafia founder Guiseppe Mazzini. In the letter Pike talked of a Brotherhood plan for three World Wars. The first, he said, would destroy czarist Russia and create a Communist “bogeyman” which the bankers could employ to justify their foreign interventions around the world. The second, Pike said, would be used to create Israel, which would become a mercenary force for the international bankers, protecting Middle Eastern oil interests for Rothschild and Rockefeller combines. In June 2001, a female Russian doctor stated in a Pravda column that the US would be subject to a massive terrorist attack in late August 2001. She was then asked what she believed was coming next. She suggested selling dollars and buying Russian rubles, saying that the secret group behind 911 was the most powerful force in the world, worth over $300 trillion. She said this group would soon “strike America in the back” while it was down and that the next shoe to drop would be the decimation of the US economy. This “secret group” could only be the Illuminati Rothschild-led Eight Families. Cecil Rhodes, the Rothschild protégé who founded the Business Roundtable in the early 20th century wrote his last will and testament in 1877. Rhodes’ vision was implemented through the establishment of the Royal Institute for International Affairs in London. Rhodes founded the Standard Chartered Bank, whose UAE Dubai branch supplied the 911 hijackers with the funds needed to carry out the attack. TGE & TLB Highly recommends you visit Left Hook by Dean Henderson A Weekly Whack at the Global Oligarchy. Deep Independent Journalism About Who Really Controls The World. Who Wants To Be A Carbon Trillionaire?